From Nursing Home Neglect & Abuse to Financial Elder Abuse to Will & Trust Fraud: Joel Bryant Provides Full Service Litigation For Elders. The more you represent elders, the more you realize that most have done everything that has been asked of them during their lives. When their country called, they stepped up. When their families, friends, or neighbors needed help, they were there to provide it. Many of these elders helped out and looked after others their entire lives, and as they enter their twilight years, it is time for someone to do the same for them. When I’m representing these people, I feel I’m doing something good for the world. There is nothing ambiguous about it. There is no need to question if I’m doing the right thing,” says Joel Bryant, partner with Green, Bryant & French LLP. For Bryant, providing the best representation for elders and their families means providing litigation services for all of their needs. Despite the fact that Bryant loves the work he does, he admits he did not set out to become an elder abuse attorney. But that has more to do with the fact that when he graduated with his law degree from the University of San Diego School of Law in 1990, the field of elder abuse was basically nonexistent. “Prior to the Elder Abuse and Dependent Adult Civil Protection Act, (EADACPA) which was enacted in 1991, it was exceedingly difficult to find attorneys to take on tort cases on behalf of injured elders and those elders who had been exploited financially. The laws were unfavorable towards elders. The deck was stacked against elders. Once EADACPA passed, it put elders on an equal footing with everyone else,” Bryant explains. It wasn’t long though after EADACPA passed that Bryant, who was representing businesses primarily in the field of construction law at Perkins & Miltner, LLP, that “an elder abuse case stumbled into our office. Our client had been sued and was seeking representation, so my first case was actually defending against an elder abuse claim. It went well for my client, and not for the plaintiff. At the end of the case, though, I wanted to represent plaintiffs in elder abuse cases. I saw that elders were being neglected in nursing homes and taken advantage of financially. I had an aha moment, and saw that this was an underserved niche and a very challenging one as well. I was never really enamored with construction law,” Bryant says. “As I gained more experience, I realized that elder abuse law offered a rare opportunity to help elders and their families in a meaningful way-to help them rebuild their lives and to protect them from being taken advantage of physically, financially or otherwise,” he adds. Bryant admits that his passion for working with elders and their families wasn’t without its challenges. “Beginning with my first job as an attorney and continuing to this day, I have been blessed to work alongside some wonderful people and excellent attorneys. But it was a bit tricky to learn the intricacies of elder law litigation without the benefit of a mentor experienced in that area of the law,” he says. Continuing, he adds that while “other attorneys involved in that area of the law have always been generous with their time, thoughts and analysis,” he was, by and large, self-taught in the field of elder abuse law. As such, in late 2004, Bryant joined forces with Jeff French and Ron Green to form Green, Bryant & French LLP, wherein Bryant would specialize almost exclusively in elder abuse cases, while his new partners remained in the field of construction, homeowners association and real estate law. But the pairing would provide Bryant with large firm resources that would enable him to provide full service elder abuse litigation on a contingency or hourly basis, in three key areas. “My typical clients are an elderly person (or their families) in a nursing home who has been neglected and suffered serious injury or death as a result; an elderly person who has been financially exploited by someone they know and trust; and a beneficiary of a will or trust who has sustained monetary damages as a result of will or trust fraud,” Bryant says. With the launch of his new firm, Bryant was determined to provide all of the types of elderly law litigation needed by clients. Bryant says, “Focusing on and gaining experience in the most common litigation needs of the elderly, as opposed to just one of those areas,” has been crucial in his firm’s growth, and today Green, Bryant & French, LLP is recognized as “one of the few-perhaps the only attorneys-with substantial experience in all three aspects of elder law litigation. This breadth and depth of experience leads to more comprehensive legal analysis and strategy in each case, which accomplishes better results for our clients,” he explains. Case in point, Bryant is happy to try cases in both civil and probate court, which he has found to be extremely advantageous for his clients. “A lot of elder abuse occurs in the form of will and trust fraud. Many of those cases must be handled in probate court. If you only work in civil court, you won’t know the remedies and procedures of probate court and won’t be able to assist those elders or their families. The comfort and ability to handle cases through trial in both civil court and probate court gives us a big advantage. This is particularly true in those situations where I have the option of litigating the case in either civil court or probate court and my opposing counsel is only experienced in one or the other,” Bryant says. Similarly, part of Bryant’s commitment to providing a “one-stop-shop” for elder litigation cases includes the willingness and ability to take on cases that require him to cover the upfront costs of these contingency cases. “Nursing home cases are complex and very expensive to handle. Moreover, attorneys handling these cases are expected to front all or most of the substantial costs because most clients cannot afford to do so. This can be a big deterrent for newer attorneys, because they cannot afford the risk of putting all of their limited financial resources in one basket so to speak. I always encourage newer, or less experienced, attorneys in this field to joint venture the case with another experienced attorney who has the financial resources to see the case through. If they see a good case, they should consider joint venturing with another attorney to share the costs and the risk,” Bryant says and adds that “roughly 10% of his cases involve co-counsel work with other attorneys in other firms.” “If the defense wants to fight a war of attrition, we have the resources to fight the big fights. The defendants know in our cases that we will still be there at the end, ready and prepared for trial. The defendants know that we don’t ever have to settle cheap because we ran out of money,” he adds. Finally, Bryant’s determination to provide full service is bolstered by his personal involvement, and continuing education to ensure that he remains at the forefront of elder abuse law. He is a consultant and committee chairperson for the San Diego Financial Abuse Specialist Team (FAST), whose mission is to increase the effectiveness of elder financial abuse reporting and prosecution and to increase public awareness of the problem through education. Bryant also served on the Board of Directors for six years for Senior Community Centers, a charitable organization which provides food, housing and social services to senior citizens to help them maintain their health, independence and dignity. Likewise, for three years, he served on the Board of Directors for the Senior Housing Corporation. The Senior Housing Corporation is a charitable organization whose mission is to provide affordable housing to low-income seniors. For Bryant, there are no concrete plans for growth of his firm, which presently includes 3 equity partners, 5 associates and 2 of-counsel attorneys. He’s not interested in growing his firm just for the sake of growing it. But he does acknowledge that “there is a need for good, dedicated attorneys in the field of elder abuse litigation. As the baby boomers age, we will undoubtedly grow to meet the increasing legal demand for elder law litigation attorneys. However, our challenge is to ensure that as we grow, we add quality people to assist in maintaining our excellent level of personal service to our clients,” he says. For Bryant that means that attorneys joining Green, Bryant & French, LLP will adhere to the same philosophy as the firm’s founding partners. “We are open and honest with our clients and keep their best interests in mind at all times. We tell them what they need to know, not what we think they want to hear. We want our clients well-informed and to proceed through litigation with their eyes wide open,” he says. It is important to Bryant that his firm maintain this level of service, and corresponding excellent reputation, as he admits that when it comes to working in his niche field, “my clients rarely have a need for an elder abuse attorney twice.” For Bryant that means that he must deliver premium service to each client, to ensure that they do send him a great deal of referral business. “Hopefully, I am known as a good, smart, honest and ethical attorney who is a zealous and effective advocate for his clients,” he says. It appears that he is certainly viewed as such by the San Diego legal community. Bryant has been selected as a San Diego Super Lawyer in Elder Law for the last three years and was recognized by the San Diego Daily Transcript in 2012 as one of San Diego’s Top Attorneys. Bryant is rated AV Preeminent by Martindale-Hubbell, (the organization’s highest rating for ethical standards and legal ability). He served as President of the Consumer Attorneys of San Diego in 2011, and served on its board of directors for 11 years. He is also on the board of directors for the Consumer Attorneys of California and has received its Presidential Award of Merit. He serves on the Judicial Election Evaluation Committee and the Court Funding Action Committee of the San Diego Bar Association, and is a member of the American Association for Justice (formerly American Trial Lawyer Association). Yet for all of his involvement in the legal community at large, what continues to drive Bryant to work hard is his steadfast belief that “Elders are a particularly vulnerable and underappreciated part of our society and they are in dire need of competent attorneys to protect their interests and enforce their rights.” Fortunately, his motivation to be that attorney who protects them stems directly from the elders themselves, and the families he fights for. “I feel great representing these people. They have given me a much better perspective on life. My elderly clients have made me realize how important our health is, and how precious life is. They have taught me to always set aside adequate time for family, friends and fun, and to live each day to the fullest,” Bryant says with a smile. 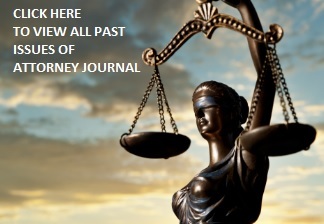 Consumer Attorneys of San Diego, President in 2011 and member of Board of Directors for 11 years.